Welcome to London Online's Tower of London Virtual Tour. The Tower of London is intimately intertwined with the history of London and exceeds every building in England in terms of historical interest. This is a virtual walkthrough of the most interesting parts of the Tower. 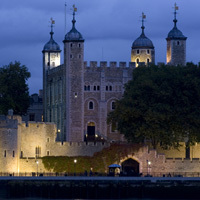 For more historical information about the Tower, visit the main Tower of London page. If you enjoy our virtual tour of the Tower, why not book a real tour of the Tower and Crown Jewels. Tickets are available from our London Attractions page.